Clément, JL., Pelletier, Y., Solla, F. et al. Eur Spine J (2019) 28: 581. In adolescent idiopathic scoliosis (AIS), there is a close relationship between thoracic kyphosis (TK) and proximal lumbar lordosis (PLL). The hypothesis states correction of hypokyphosis increases lumbar lordosis (LL) through increase in PLL after surgical correction of TK. 111 consecutive thoracic AIS, Lenke 1 or 2 who underwent posterior selective thoracic fusion with reduction by simultaneous translation on 2 rods and 2 years follow-up have been prospectively selected and analyzed. Instrumentations below L1 and anterior releases were excluded. Global TK and LL were measured by a dedicated software. Mean values were compared through T test, correlations assessed through Pearson’s coefficient. Global TK increased from 27° to 46° at the last follow-up (p < 0.0001) and LL from 58° to 65° (p < 0.0001). PLL increased by 8° (15°–23°), and distal lumbar lordosis remained stable (42°). The gains were higher for the Hypo-Kyphosis group than for the Normo-Kyphosis group (p < 0.001). There was a strong correlation (coef = 0.65) between TK and PLL as well as between the gain of TK and the gain of PLL (coef = 0.70). LL increased after the first postoperative month. At 1 month, there was a significant increase in pelvic tilt and decrease in sacral slope, offsetting the LL increase, and indicating a temporary pelvic retroversion. Increase in TK led to increase in uninstrumented LL through increase in PLL with a continuous correlation between TK and PLL. These results allow surgeons to calculate the TK required during surgical correction of thoracic AIS to adapt LL to pelvic incidence. The online version of this article ( https://doi.org/10.1007/s00586-018-5740-8) contains supplementary material, which is available to authorized users. Hypokyphosis is a typical feature of adolescent idiopathic scoliosis (AIS). It is linked to the three-dimensional deformation of scoliosis. The thoracic scoliotic curve develops in an intermediate plane between the coronal and sagittal plane. Its sagittal projection results in a low thoracic kyphosis (TK). The correction of hypokyphosis remains difficult to obtain by modern instrumentation. Many publications have shown little evidence of significant variation or the decrease in TK after surgery with rotation of the rod, direct vertebral rotation, or cantilever reduction [1, 2, 3, 4, 5, 6]. Conversely, translation techniques are more likely to improve TK [7, 8, 9, 10, 11]. It has been shown that the increase in TK by surgery leads to an increase in lumbar lordosis (LL) without correlation between reciprocal changes in TK and LL . From the current literature, “Given the long-term importance of LL in maintaining sagittal balance, it seems prudent to increase TK and thus LL” . In AIS, the hypokyphosis is correlated with a low LL, which is due to a low proximal lumbar lordosis (PLL). There is a close relationship between TK and PLL. The distal lumbar lordosis (DLL) remains related to pelvic incidence (PI) and sacral slope (SS) . The aim of this work is to analyze how the surgical increase in TK effects LL and its two components, PLL and DLL, as well as pelvic parameters. The hypothesis is correction of hypokyphosis increases LL through increase in PLL. Consecutive patients with thoracic AIS, Lenke type 1 or 2 were collected from a prospective data base, in a pediatric orthopedic center between 2010 and 2015. Patients underwent a posterior thoracic selective fusion and correction by simultaneous translation on 2 rods (ST2R) with a minimum of 24 months postoperative follow-up [8, 10, 11, 15]. Patients with instrumentation below L1 were excluded to better analyze the spontaneous evolution of uninstrumented LL. The rods were bent during the surgery according to the operator’s experience and without proper planning apart from trying to adjust to the patient’s pelvic incidence. Exclusion criteria included patients with additional anterior release. 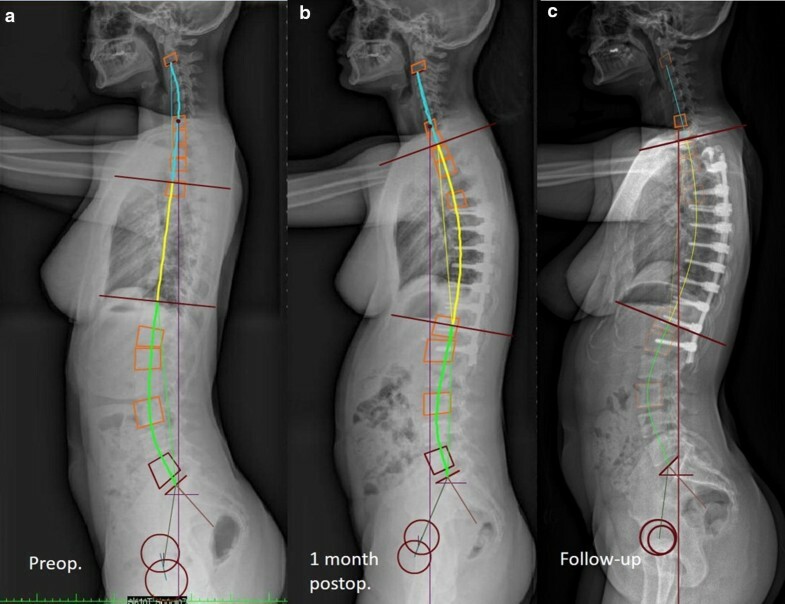 Patients were divided into two groups: Normo-Kyphosis group with normal preoperative TK greater than 20° and, Hypo-Kyphosis group with preoperative TK less than 20° . For all patients, full spine standing X-rays were performed preoperatively, 1 month postoperatively and at the last follow-up as a part of the routine evaluation of the scoliosis cases. The lateral radiographs were taken on the same medical imaging network in standing position with the arm lying horizontally, hand on a support and visualizing the entire spine from the auditive canals to the proximal extremity of the femurs. All the measurements were performed automatically by the software “Keops Analyser” after graphic identification of landmarks (femoral heads, sacral plate, iliac wings, coracoids, etc. ), vertebrae, and sagittal curves, established by the same surgeon (JLC). This digital measurement method is superior to the direct measurement on X-rays . The global thoracic kyphosis was calculated by measuring the totality of the vertebrae in kyphosis independent of a fixed vertebral level. The global TK is defined by two inflection points: the superior point between TK and cervical lordosis, and the inferior point between TK and LL. Similarly, global lumbar lordosis was measured by the point of inflection between TK and LL and the sacral plate . We noted the level of the inflection point between the curves, as well as the number of vertebrae in each of the sagittal curves.According to Vaz and Roussouly , LL was divided into proximal and distal LL. In a same way, TK was divided into proximal and distal TK (Fig. 1). Proximal thoracic kyphosis (PTK) is the angle between the horizontal line and the inflexion point between TK and cervical lordosis. PTK is the part of the kyphosis lying over the horizontal line independently to a vertebral level. Distal thoracic kyphosis (DTK) is the angle between the horizontal line and the inflexion point between TK and LL. DTK is the part of the kyphosis lying under the horizontal line independently to a vertebral level. DTK is geometrically equivalent to PLL. The sagittal balance was measured by the C7 Plumb line-S1 distance. Mean values were compared through paired or impaired T test. Correlations were assessed through Pearson’s correlation coefficient or linear regressions. Significance level was set at 0.05. All analyses were performed with XLStat Addinsoft®. All procedures were in accordance with the ethical standards of the institutional research committee and with the 1964 Declaration of Helsinki and its later amendments or comparable ethical standards. This study has been approved by the authors’ Institutional Review Board (IRB): French CPP (committee for the protection of persons) with number 2012-A01663-40, ref 13.003, and protocol 72082012. Informed written consent by both parents and patients has been obtained. With a total of 111 patients, 32 in the Hypo-Kyphosis group and 79 in the Normo-Kyphosis group were included. The mean follow-up was 64 months (24–175). In the coronal plane, the main thoracic curve decreased from 52° (35°–80°) to 16° (1°–36°) at follow-up which correspond to an average correction of 69%. Increase in TK, LL, and PLL in Hypo-Kyphosis group was higher than in Normo-Kyphosis group (p < 0.001). Tables 1, 2, and 3 show the values of the sagittal pelvic and spinal parameters for the whole cohort and for the two groups. There was a strong correlation between PLL and TK preoperatively (Pearson’s coefficient = 0.69) and at last follow-up (Pearson’s coefficient = 0.64) (Fig. 2). Correlations between TK and LL were weak, both preoperatively and at last follow-up (Pearson’s coefficient = 0.34 and 0.32). From linear regressions (Fig. 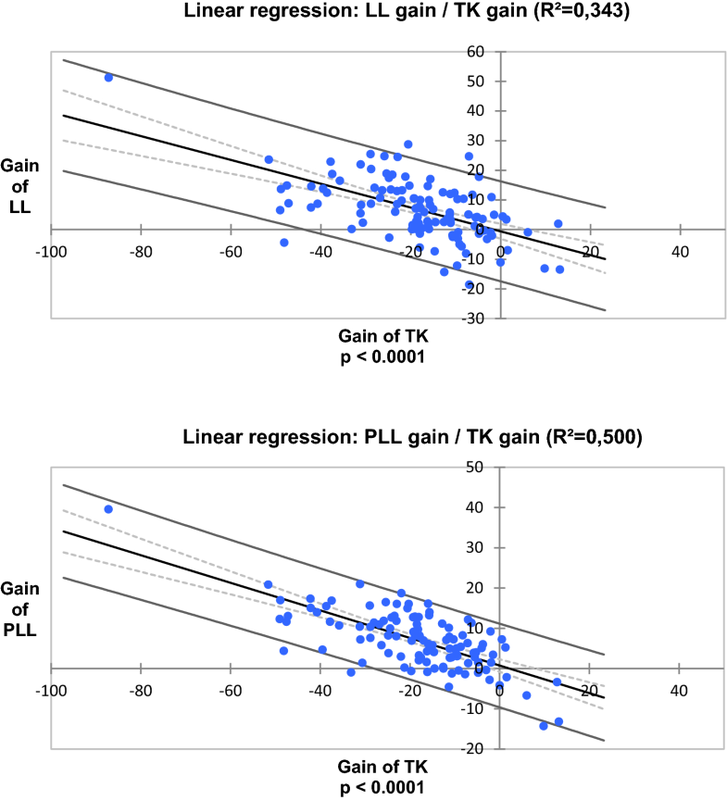 3), the gain of PLL significantly correlated with the gain of TK (Pearson’s coefficient = 0.7) (PLL gain = 0.34* TK gain) as well as the gain of LL (LL gain = 0.4* TK gain). The increase in TK from AIS surgery resulted in an increase in LL through the increase in PLL (8°). Thus, the hypothesis is accepted. This is explained by the geometric construction that divides lordosis and kyphosis into two proximal and distal parts (Fig. 1). The transitional vertebra between DTK and PLL is the point where the curves are reversed. Increasing the slope of this transitional vertebra by improvement of TK from the surgery automatically induces an increase in PLL. There is a strong and continuous correlation between TK and PLL due to the geometric equivalence between DTK and PLL. The equation, LL gain = 0.4* TK gain, means 40% of the gain on TK is transferred to gain on LL through the increase in the slope of the transitional vertebra. The remaining 60% concerns the PTK. We assume that a similar geometrical construction could be extended to the cervical spine with the PTK being equivalent to the distal cervical lordosis. Thus, the increase in PTK could improve cervical lordosis. The gain in LL is greater for the hypokyphosis group (13°) than for the normal kyphosis group (4°), the final targeted TK for all patients being the same. A contemporary LL and TK increase during anterior  or posterior fusion has been reported [10, 12]. However, no significant correlation was found between sagittal reciprocal changes . Conversely, a postoperative loss in TK results in a loss of LL of the uninstrumented lumbar spine . PLL has not been analyzed in these studies. Moreover, TK was measured between T4 or T5 and T12 [12, 13]. This segmental kyphosis only reflects a part of the total kyphosis of the patient, but it does not describe what happens above or below. With measurements of the global kyphosis and lordosis, we found a significant correlation between TK and PLL (Fig. 2) and between the TK gain and the PLL gain (Fig. 3), reflecting the geometrical relationship between these angles. PI, PT, and SS remained unchanged between preoperative and last follow-up in the two groups. This suggests that surgical increase in TK using the ST2R technique and selective fusion does not alter pelvic alignment in the long term. DLL, which is equivalent to SS, did not vary at follow-up. Increasing PLL by increasing TK is likely the only way to improve lumbar lordosis in thoracic selective fusions.Interestingly, our results showed that improvement of lumbar lordosis occurred after the first postoperative month, while the increase in kyphosis is present at the first month. This chronological sequence and strong statistical association suggest a casual relation. At 1 month postoperatively, there is a significant increase in PT and decrease in SS, indicating a temporary retroversion of the pelvis, offsetting the PLL increase (Table 1). This is the consequence of the new postoperative balance. As the C7 Plumb line-S1 does not change significantly, the global sagittal balance is still maintained. The initial resistance of the lumbar muscles and ligaments probably forces the patient into pelvic retroversion to maintain his balance. Then, during the following months, lumbar lordosis increases with return of pelvic parameters (SS and PT) to baseline (Fig. 4). Patients appear to require a period of adjustment to adapt to their new TK . Figure 4 shows that the TK increase is initially due to the increase in the slope of the cervical spine/TK inflection point, while the retroversion of the pelvis partially cancels the LL increase. In a second step, the return of the pelvis and SS to its initial position and the maintenance of the sagittal balance allow the increase in LL and the increase in the slope of the TK/LL inflection point. Measurement of the global kyphosis implies that TK can vary in extent after the surgical correction. In the Normo-Kyphosis group, the number of vertebrae (10 vertebrae) included in TK did not significantly change between preoperative and follow-up (Table 3). Conversely, in the Hypo-Kyphosis group, the number of vertebrae included in preoperative TK was lower (7 vertebrae) and increased significantly up to 10 vertebrae (Table 2). Thus, in cases of “short” thoracic kyphosis, the surgical correction can increase the extent of TK. Reciprocally, the number of vertebrae in global LL decreased significantly by 1 vertebra in both groups. The average point of inflection is thus lowered by one level from T11 to T12 and the global TK extends, on average, from T11 to T2. This study also allows appreciation of the TK distribution between PTK and DTK. In the entire cohort, the DTK is measured at 23° and global TK at 46° (Table 1). TK is thus divided in half for DTK and half for PTK. This is different from kyphosis gain due to surgery, 40% of which is intended for the PLL increase. This difference can be explained by the fact that the surgical correction of TK concerns the instrumented part of TK which is only a part of the global TK. The value of 46° for postoperative TK may seem excessive. The global TK measured from the uppermost tilted vertebra to the lower most tilted vertebra is higher than a fixed TK measured between T5 or T4 and T12. T4–T12 TK does not measure what is happening above T4 and below T12. The normal values allowed for global TK range from 15 to 55° . The value of LL is also high (65°) which corresponds to 15° more than PI (Table 1). Aging of the spine is often associated with decrease in LL due to degenerative disk disease. Bernstein establishes thoracal flat back as a risk factor for lumbar degenerative disk disease after spinal fusion . The restoration of a large LL adapted to PI constitutes a capital for the long-term future of operated AIS. The monocentric prospective inclusions and longitudinal study, the automatic measurement of the angular values, and the measurement of the global and not segmental kyphosis and lordosis are the strengths of this work. Consideration should be taken into the lack of comparison with a case series where postoperative kyphosis would have been unchanged or decreased. With this translation reduction technique, we have only one case with mild thoracic hypokyphosis (19°) at follow-up and no possibility to get a comparison case series. However, it has already been shown that the decrease in TK causes a decrease in LL . Knowing the effect of surgical correction of kyphosis on LL, it is possible, in the other direction, to predict thoracic kyphosis as a function of PI and LL . We propose to adapt LL to PI according to the relation LL = PI + 15° as we found in our series. One can deduce the PLL (PLL = LL − SS) and thus the DTK (DTK = PLL) to calculate the targeted TK = DTK + PTK and DTK = PTK. Finally, we came up with a simple formula: TK = PLL × 2 that to say TK = (LL − SS) × 2 and TK = (PI + 15° − SS) × 2 or TK = 2(PT + 15°). It only remains to adapt TK to the length of the instrumentation by relating it to the number of instrumented thoracic vertebrae, the global TK of this study consisting of 10 vertebrae (T2–T11). Therefore, it seems necessary to use a surgical technique that can increase the TK and to be able to bend the rod with a defined and calculated angulation. This is currently possible thanks to the Patient-Specific Rod techniques. It is now the process we use which we will have to check the effectiveness. In a series of 111 AIS operated by selective posterior fusion and reduction by simultaneous translation on 2 rods, the increase in thoracic kyphosis obtained by surgery led to an increase in the uninstrumented lumbar lordosis through the increase in proximal lordosis. The gain in lumbar lordosis was close to 40% of the gain in thoracic kyphosis. This is explained by a continuous correlation between the thoracic kyphosis and the proximal lumbar lordosis due to the geometric equivalence between distal thoracic kyphosis and proximal lumbar lordosis. 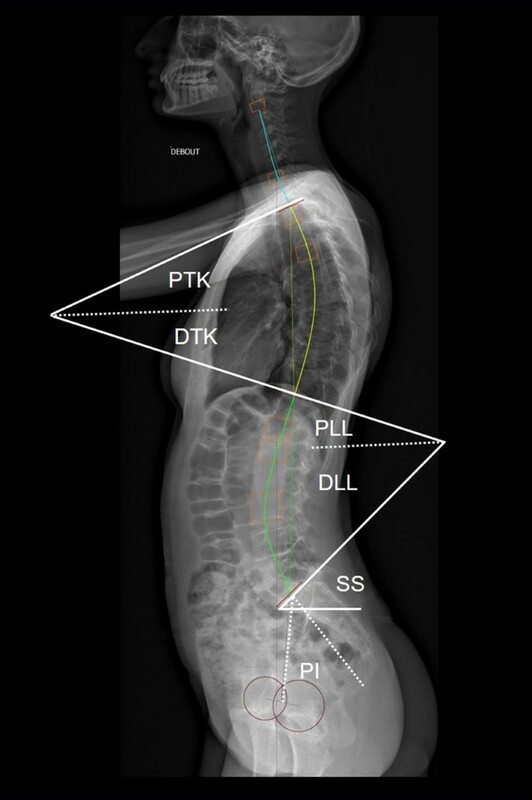 This allows for the calculation of thoracic kyphosis required during surgical correction to adapt the lumbar lordosis to the pelvic incidence of the patient, and then bend the rod with a suitable contour. Jean-Luc Clément has received consultancy fees and financial support for attending symposia (unrelated to this study) from Médicrea. Federico Solla has received financial support for attending symposia (unrelated to this study) from Médicrea. (Médicréa International, Rillieux La Pape, France).